A volunteer is marshaling resources for the restoration of Detroit’s island jewel. Two years ago, Bernadette Doré sat hatless but not heedless in a sea of colorful chapeaux at the Belle Isle Casino, listening closely as a poised 50-something community activist with blond curly-fry locks spoke passionately about the need to preserve one of Detroit’s true treasures — the very island 400 guests had gussied up in their spring finery to travel to. For some attendees at the annual “Polishing the Jewel” fundraising luncheon, it was their first visit to Belle Isle in many years. Belle Isle has always been an integral part of Detroit life, even as the city’s budgetary woes began exacting a toll on its many charms, both man-made and natural, decades ago. But for those who haven’t been paying attention, the only island park in the country has been on the rebound, thanks in part to the missionary zeal of Earley and the activists called the Belle Isle Women’s Committee (BIWC). Their collective efforts have resulted in an $800,000 spruce-up of the westernmost tip of the 982-acre island, known as Sunset Point. In August, workers will finish nearly two years of improvements that include new lighting, landscaping, benches, and picnic tables, as well as a sidewalk that for the first time will make this spot accessible to mothers pushing strollers and visitors in wheelchairs. The most expensive part of the project is the new $460,000 comfort station whose red brick and tiled roof are in keeping with the style of other buildings on the island. Refurbishing the long-neglected park is a tall order, a pie in the sky even, some might say. But the steely determination of a devoted group, or just one person, can effect change. One can look at Detroit’s Orchestra Hall to see how a quixotic vision can became a reality. The historic 1919 music hall on Woodward and Parsons was slated for demolition when Paul Ganson, a bassoonist with the Detroit Symphony Orchestra (DSO), stubbornly led a $6.8-million fundraising drive that lasted 20 years but ultimately restored the building, the DSO’s former home, to its old glory. In the 1970s, the building leaked. Chunks of plaster fell to the floor. Walls had gaping holes. It was a grim sight, but Ganson saw promise and possibility. Few people back then could envision that the DSO would call the building, which it abandoned in 1939, its home again. But in 1989, as a result of the initial dogged determination of the Committee to Save Orchestra Hall, the orchestra moved from Ford Auditorium to the gloriously restored Beaux Arts structure. Although Earley has never considered herself a one-person crusade, it’s clear that without her leadership any improvements would still be at the talking stage. Earley has managed to corral some of the best-connected and philanthropically active women in town. “We never wanted to be viewed as just a bunch of girls in the suburbs, saying, ‘Oooh, we can save the park!’ ” she says one day at her Bloomfield Township home. “We really have a nice representative cross-section of city and suburban women.” Many are married to men of position or are self-empowered. Supporters and some board members include such familiar names as Florine Mark, Trudy Archer, Debbie Dingell, Sheila Cockrel, Dawn Rassel, and Kathryn Penske. Earley is married to Tony Earley, the CEO and chairman of DTE Energy. It doesn’t take much research to know Detroit’s “jewel in the river” has grown tarnished since Olmstead started his design in 1879, with budget cuts and general neglect causing such longtime attractions as the children’s zoo and aquarium to shut down. The city had commissioned a master plan for the island in 2000, but the report by Detroit-based Hamilton Anderson Associates has never been formally adopted by the city council. Small wonder. While the plan calls for capital improvements approaching $200 million, the city has its hands full just keeping up with basic maintenance like mowing grass and picking up trash. Top-drawer renovations have long been left to private groups, and those efforts are collectively starting to make a discernible difference. Penske, for example, spearheaded a drive to clean up Scott Fountain and improve roads and foliage before bringing Grand Prix auto racing to the island. Other support organizations — the Friends of Belle Isle, the Belle Isle Botanical Society, and Friends of the Belle Isle Aquarium — regularly struggle to meet their own objectives. “This is where I thought I could make a difference,” Earley says. “These organizations do tremendous work, but they don’t have the entrée into the corporate world, which is where the really significant donations usually come from.” In late 2004, Earley held the first organizational meetings of what became the Belle Isle Women’s Committee. The following year, the inaugural Polish the Jewel luncheon raised about $300,000, much of it in contributions from corporate sponsors, including Comerica, General Motors, Masco, AT&T, and DTE Energy. A silent auction of new and estate jewelry raised additional cash. Earley, her eye on creating different revenue streams, also commissioned a unifying design for a line of custom jewelry that can be ordered as a pin, pendant, or charm, with all profits plowed back into the restoration fund. In November 2006, contractors broke ground on the first improvements at Sunset Point. Although few of the 4 million visitors to Belle Isle each year pause to think about it, the place has a remarkably rich past, taking in the full sweep of events and personalities that color local history. Through the 1700s, Native Americans called the island Mah-nah-be-zee (“the swan”), a graceful name ignored by French settlers, who referred to it as Ile aux Cochons, or “Hog Island.” According to local legend, at the time rattlesnakes had overrun the island, prompting the French to release a number of hogs to destroy them. It’s more likely the hogs were there because Antoine de la Mothe Cadillac, the founder of Detroit, had declared the island a public commons as a refuge for livestock to protect them from rustlers and the “savages.” In any event, blood was occasionally spilled on the island over the years, including an Indian massacre during Chief Pontiac’s siege of Detroit in 1763 and many deadly duels between short-fused citizens. The deed to the island ultimately passed through the hands of two old-line families, the Macombs and the Campaus. Although it was private property, by the 1840s boaters were treating it as a public picnic grounds. Some decided the island’s swinish name no longer befit its grandeur. At a Fourth of July party in 1845, several leading citizens rowed out to the place and renamed it “Belle Isle,” the Anglicized version of the French words meaning “beautiful island.” To prove they meant business, they ceremoniously poured a bottle of water on the ground. Some historians claim they intended to honor Isabella Cass, the youngest child of Michigan’s foremost politician, Lewis Cass. Whatever their intention, the name stuck. In 1879, the city bought Belle Isle from the Campau family for $200,000. Detroit had taken on the characteristics of a rapidly growing manufacturing center — smoke, noise, overcrowding — and the island was viewed as a convenient escape from urban ills. Within four years, Olmstead had designed the park, replete with a canal system and a pedestrian and carriage street winding around the island. In 1889, a wooden bridge connecting Belle Isle to Jefferson Avenue was built; after it burned in 1915, it was replaced by a temporary span until the current Art Deco-style structure (later named after Gen. Douglas MacArthur) opened in 1923. By 1904, the architect of Henry Ford’s industrial empire, Albert Kahn, had designed some of the island’s signature structures, including the conservatory and aquarium. A few years later, nearly 300 acres of landfill were added at the western end of the island to accommodate Scott Fountain, an engineering feat that increased Belle Isle’s size by nearly a third. The gleaming white marble, terraced-step fountain features the bronze sculpture of James Scott, an odd and cantankerous citizen who had bequeathed $500,000 to the city for its construction. Meanwhile, monuments honoring newsboys, veterans, and an array of dead white men began to dot the landscape. Dueling boomboxes aside, Belle Isle mostly has been an idyllic place to walk, jog, bike, golf, fish, and watch freighters and people pass by. In the early 1900s, a wide-eyed ballplayer named Ty Cobb spent a good deal of his free time exploring the island, comparing its natural charms favorably with those of his native Georgia. In 1906, Harry Houdini performed one of his most famous death-defying feats, plunging 25 feet into the icy Detroit River in handcuffs and emerging safely several agonizing minutes later. During the Great Depression, a young boxer named Joe Louis did his roadwork there; at the same time a special “suicide squad” of police did its best to stem the growing number of woebegone citizens throwing themselves off the bridge. For years, boaters at the Detroit Yacht Club and Detroit Boat Club called Belle Isle their homeport. In World War II, the island was the target of a mock invasion by thousands of soldiers and sailors training for the real thing overseas; it also was the flashpoint of the deadly 1943 race riot, when fights between blacks and whites on a steamy Sunday spilled over into the downtown area. In the 1950s, a Nike missile base was installed on the island as a Cold War deterrent. Throughout, the island has hosted countless communal gatherings, from school outings and family barbecues to Detroit’s first “love-in” in 1967. Generations of the automaking Ford family have frequented the island, leading one descendent, Edsel Ford II, to recently describe himself as “kind of a stepchild” of the park. “It’s amazing how many people have these long personal histories of Belle Isle that go back generations,” says Doré. “Florine Mark, for example, told me how her grandparents used to camp on the island.” Earley recalls a lady showing off a photo of her parents on their first date, seated inside a rented canoe at Belle Isle in 1937. Although she moves comfortably in upscale social circles, Earley was no child of privilege. She grew up Sarah Belanger in Belmont, Mass., the only daughter of a waterproofing contractor. She had five brothers, which honed her competitive skills. She attended public schools, and later earned a B.A. from Saint Mary’s College and an M.B.A. from San Diego State University. When she married Anthony Earley, Jr., in 1972, he was a young naval lieutenant fresh out of Notre Dame. After serving five years, most of it on a nuclear submarine, the future energy honcho went back to school on the G.I. Bill. The young couple scrambled like most to make ends meet while starting a family. 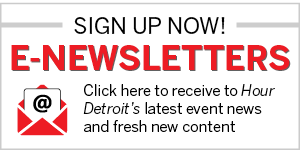 The BIWC luncheon has swiftly grown into a staple of Detroit’s spring social calendar. At this year’s gathering in May, Doré channeled her inner milliner and showed up for the first time wearing a hat — a custom-made number to go with her red suit. Many of the hats seen at the group’s events are created in the Wyandotte millinery shop of Gena Conti, who contributes a percentage of all sales to the BIWC. Adding to the festive mood was another healthy infusion of dollars to apply toward the next project on the group’s to-do list: restoring historic horse stables near the conservatory. The Arts and Crafts-style barn, with its distinctive cupola and tile roof, is now being used to store maintenance equipment. According to Earley, the goal is to turn it into a multipurpose complex that would accommodate a children’s learning center, gift shop, café, and studios for artists. “It would be a wonderful attraction to bring people to the island,” she says.